Most people’s lives are measured in years. Crimson King’s life was measured in minutes. She was born Jan. 3 at 5:22 p.m. She was pronounced dead at 6:22 p.m. Sixty minutes. Time enough to cry out eight times. Time enough to open her eyes and gaze at her mother’s face. Time enough to create memories for her family that will never fade. “She was beautiful,” her father, Jason King, said days later at the funeral. “From the outside, you would never know anything was wrong with her.” But Jason and Aubrey King knew Crimson never had a chance. The Colorado Springs couple learned 16 weeks into the pregnancy that Crimson had Potter’s syndrome, a rare condition marked by a lack of kidneys. Crimson was not the first loss for Aubrey King, a stay-at-home mom, and Jason King, an active member of the U.S. Air Force Reserve at Schriever Air Force Base. Aubrey King had given birth three times before. Three perfect, textbook pregnancies — Burgundy, now 7, Courtland, 4, and Ashton, 1½. In March, she suffered a miscarriage, but she soon was pregnant again. The Kings, both 33, were hoping for a girl, a baby sister for Burgundy. They were delighted when they learned Aubrey carried twins. They wouldn’t find out for sure until much later, but they always felt the twins were girls. A six-week ultrasound showed no problems. “They looked perfect at that point,” Aubrey King said. In June, at eight weeks, one twin died. That twin, it was discovered, was acardiac, meaning its blood flow was provided by the other twin. It would have had no chance to survive long term. The twins also were monoamniotic, a condition in which identical twins share a common amniotic sac. That condition is accompanied by an increased risk of birth defects and death. Still, there was hope for the surviving twin. In the 15th week, though, Aubrey King knew something else was wrong. Her belly had shrunk. She had lost 2 pounds. An examination revealed she had no amniotic fluid. There was the possibility her sac had ruptured, that amniotic fluid could return. But Potter’s, a condition affecting about 1 in 4,000 births, was another possibility — one confirmed days later. Doctors were clear. The Kings’ baby could not survive outside the womb. The Kings had dreamed of two little babies to cuddle and love. Now there would be none. It’s incredibly tough to shatter a couple’s hopes and dreams and tell them their baby will not live, said Dr. Kevin Weary, Aubrey King’s obstetrician. It is also, he said, one of the most important things he does: comforting and guiding a couple through the decisions they must make in one of the darkest times in their lives. Abortion was never an option, Aubrey King said. Not out of a religious belief, but out of a respect for life and a love of babies. Crimson Winter Akane King lived only an hour outside the womb, but she lived for more than eight months inside her mother, Aubrey King pointed out. “I wanted her to feel happiness, to be a part of our life, even though she was in the womb, and she was.” When her husband sang in the car, Aubrey King felt Crimson turn toward him. Anytime Ashton let out a scream, Crimson kicked — and kicked hard. Shower time was mother-daughter time. Alone in the bathroom, away from distractions, Aubrey King talked to the life inside her and tried not to let the tears overwhelm her. She was honest with friends and strangers who asked about her pregnancy, telling them she was preparing not for an addition to the family, but for a funeral. Some people refused to believe that nothing could be done in this age of cutting-edge technology and mira- cle babies. Some would tell Aubrey King, “Well, at least you have three children.” As if those three lives meant it was OK to lose a fourth. At other times, Aubrey King was touched by the kindness of others. Strangers often had tears in their eyes upon hearing her story. The Kings went to Penrose Community Hospital early that Monday morning. Doctors began to induce labor about 8:30 a.m., using a drug to stimulate contractions. There was a frightening period during which Crimson’s heart rate dropped with each contraction. “We didn’t think she was going to make it out alive,” Aubrey King said. Crimson had some features characteristic of a Potter’s baby: club feet, a short neck, low-set ears. Potter’s babies, because they’re tightly packed in the womb without amniotic fluid, also often have squashedin facial features. But not Crimson. “She was gorgeous,” Aubrey King said. Crimson was placed on her mother’s chest. 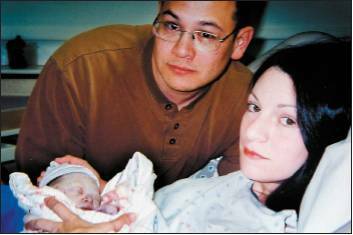 The umbilical cord, Crimson’s lifeline, was not cut until 10 minutes later, when the placenta detached from Aubrey King’s uterus. It was then that the baby’s life began to slip away. Shortly after Crimson was delivered, Weary found the inch-long form of her twin sister, Violet. “It was a miracle they were able to find her tiny, little body,” Aubrey King said. For most of the 60 minutes, Aubrey King held Crimson. Jason King held her, too, but mostly he took pictures. It helped, he said, to stay busy. At 6:22, a nurse declared Crimson dead. “I lost it,” he said. The day after, still in the hospital, Aubrey King cried until her eyes swelled shut. She kept Crimson’s body with her until she left the hospital midday the next day, Wednesday. It was not grotesque, she said. It was just like holding a sleeping baby. “Leaving the hospital and leaving her body was the hardest thing I’ve ever had to do in my life.” The funeral was Jan. 8, a wind-ravaged Saturday, at Evergreen Funeral Home. Crimson lay in a basket, looking like a porcelain doll with its eyes shut. Violet was there, too. The Kings decided to have Crimson and Violet cremated. Tuesday, they took home the urn containing the twins’ ashes. They put it on a shelf in their bedroom, part of a shrine that includes photos, a lock of Crimson’s hair, and blankets and clothing from the hospital. There’s also a sculpture of a couple holding a baby — a Christmas present, Aubrey King said, from her husband and Crimson. DAVID BITTON, THE GAZETTE - In the midst of tragedy, Aubrey King counts her blessings: “We did get all the wishes that could be granted. We got her eyes open, we got to say what we wanted to say to her before the end.” Aubrey and Jason King and 7-year-old daughter Burgundy spent a moment together mourning Crimson. Some Potter’s Syndrome babies are born bruised because there is not enough amniotic fluid to provide cushioning in the womb. Crimson showed no bruising. “When she came out, she was perfect,” Jason King said. Visitation was held the night before Crimson’s funeral at Evergreen Funeral Home. Photos by David Bitton, The Gazette - The Kings saved all they could from Crimson’s short time with them. “We will never forget her,” Aubrey King says. The family plans to celebrate Crimson’s birthday every Jan. 3. In her final weeks of pregnancy, Aubrey King tried to provide a happy environment for Crimson. “I didn’t want to sit and cry,” the mother said. “We knew we were saying goodbye, so we could make the most out of every minute,” Aubrey King says of Crimson’s brief life. A nurse took this photo of the Kings shortly after Crimson’s birth at Penrose Community Hospital. The Kings decided to cremate Crimson so she would always be close by. 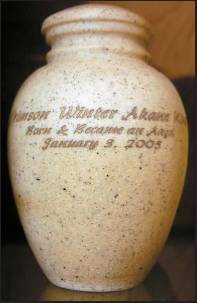 An urn holding the ashes of Crimson and sister Violet rests on a bedroom shelf. A Potter’s syndrome online support group at www.potters syndrome.org includes forums, memorials and facts about Potter’s. Pikes Peak Share, a pregnancy and infant-loss support group, meets 7 to 9 p.m. second Tuesdays at St. Luke’s Lutheran Church, 5265 N. Union Blvd. Call 531-5131. To Our Readers: There are stories of medical wonders, of babies who survive despite the odds. But not all babies survive. When Aubrey King complained to her mother, Karleene Thompson, that no one writes about those situations, Thompson contacted The Gazette. The Kings welcomed a Gazette reporter and photographer into their lives in the weeks before and after the birth — and death — of Crimson King to tell the story of how such a short life can have a lasting impact.